AT&SF. Operatin Era: 1942 - 1965. Around 599 Sk-L/N/P cars were rebuilt in 1942-43 at Albuquerque and renumbered in the 52000 series. 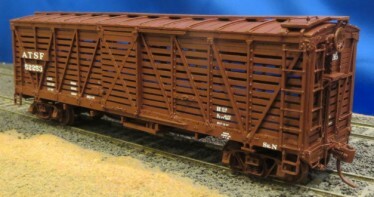 These cars received radial roofs from Bx-11/12 box cars, X-braced doors, AB brakes and Ajax hand brakes. They also had solid floors.